The 64th and final foundation for the MeerKAT telescope antenna was poured yesterday (Tuesday, February 11th, 2014) at South Africa's SKA site in the Karoo. Close to 5 000 m³ of concrete and more than 570 tons of steel were used to construct the foundations over the last nine months. MeerKAT is the South African precursor to the Square Kilometre Array (SKA) telescope, to be built in Africa and in Australia. The SKA Project is an international enterprise to build the largest radio telescope in the world. "The completion of the foundations and the soon-to-be completed first antenna represents a major milestone on building of the MeerKAT which will become an integral part of the SKA project," says Derek Hanekom, South Africa's Minister of Science and Technology. "I am very pleased with the progress and the quality of the work that our scientists and engineers are delivering on this challenging assignment and wish them well with the enormous task ahead of meeting the tight schedule in the next two years." 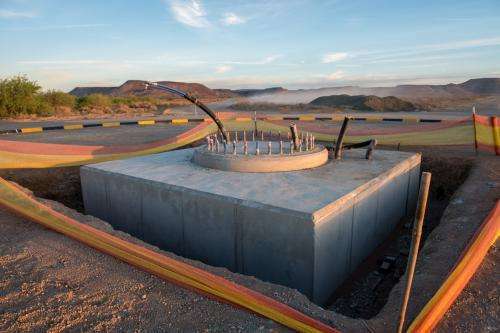 "The foundations were constructed to stringent specifications to ensure that the antennas will be exceptionally stable," said Tracy Cheetham, general manager for infrastructure and site operations at SKA South Africa. "Even at wind gusts of up to 69 km/h scientists must be able to point the dishes at distant celestial objects in an exact manner, and the antennas must be able to survive wind speeds of up to 144 km/h". To meet these stability requirements, each foundation consists of eight steel-reinforced concrete piles at depths of between 5 to 10 m, depending on the local soil conditions. A square slab of concrete (5.2 m x 5.2 m, and 1.25 m thick) rests on top of the piles to add further stability. The 32 "holding down" bolts are pre-assembled in a circle to form a steel ring cage, or so-called "bird's nest", into which the concrete is cast. All other MeerKAT infrastructure should be complete by the end of March this year. "We are on the last leg now," said Cheetham, adding that finishing touches are underway in the Karoo Array Processing Building (KAPB) and the power facility. The KABP, a specialised underground bunker protected from radio frequency interference, will house all the data processing racks and the power and back-up equipment required for MeerKAT. The primary focus for the next two months will be on verifying that all infrastructure functions according to the required specifications. Testing involves cold and hot commissioning - Cheetham explains: "During cold commissioning the power is connected without switching on the equipment. During hot commissioning the machines are turned on and tested for a period of time." Cheetham also said the ducting for the fibre optic cable has been completed, so all that is left now is for the optic fibre contractor, Plessey, to pull through and connect the cable. Each MeerKAT antenna will be 19.5 m high. Each reflector (or dish) will be 13.5 x 16 m.
Each complete antenna (base, pedestal and dish) will weigh 42 tons. The longest distance between any two antennas (the so-called baseline) is 8 km. MeerKAT will be the most sensitive radio telescope in the southern hemisphere until the SKA comes online. Once all 64 antennas are operational, the instrument will be sensitive enough to pick up a cell phone signal from Saturn! Leading radio astronomy teams around the globe have already signed up to use the instrument as soon as it is ready. The 64 MeerKAT antennas will later also become part of the much larger SKA telescope which is co-hosted between South Africa and Australia.